What is Aadhaar Number? How to get Unique Identification Number(UID)? Aadhaar is a 12 digit identification number, issued by Unique Identification Authority of India (UIDAI) to all the residents of India. In the recent days, it is being talked about in the media. UIDAI has named this Unique Identification Number as 'Aadhaar', which means 'foundation' or 'base' in many Indian languages. This Aadhaar is going to be the base for many things in future, to all the residents. 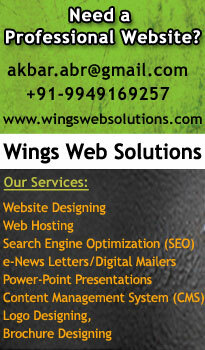 * Aadhaar is easily verifiable in an online, cost-effective way. * It is Unique and robust enough to eliminate the large number of duplicate and fake identities in government and private databases. * It is a random number generated, devoid of any classification based on caste, creed, religion and geography. * It is a 12 digit number, not only a card. * It is for every individual, including infants. Means each individual of family will have separate Aadhaar UID number. * It enables identification and is for every resident. It doesn’t establishes citizenship and is not only for Indians. * Getting Aadhaar is voluntary, not mandatory. * It is for every resident, irrespective of existing documentation. Means individuals without identification documents can also get Aadhaar. * Each individual will be given a single unique Aadhaar ID number. One cannot have multiple Aadhaar numbers. * Aadhaar UID number can be used by ration card, passport or any ID based application. It will not replace other ID’s. * UID Authority of India will give ‘yes’ or ‘no’ response for any identification authentication queries. Other information will not be accessible to public and private agencies. Though it is being talked about in media, many people do not know about the Unique Identification Number, how it is being issued, How to get this number, etc. In order to provide such basic information, on behalf of PodUniversal, we inerviewed Mr K K Sharma, Asst. Director General of UIDAI. You may listen to his interview(8 minutes). New Delhi: Soon, it may be possible for customers to operate ATMs without cards. And, eventually, shop without credit cards. Some banks and the Unique Identification Authority of India (UIDAI), which is spearheading the ambitious Aadhaar project, are looking to allow customers operate ATMs armed with only their 12-digit Aadhaar number; the access will be facilitated by a biometric scan. Experts say the move could reduce cost of operations for banks and also reduce instances of debit card fraud. Even while UIDAI is still working to fine-tune the model, state-owned Corporation Bank is readying to implement the new model. “We will be launching this service in the next three-four weeks for our customers in Delhi,” said an official of the bank, asking not to be named. With a mere 58,000 Aadhaar numbers issued in Delhi (4.2 million have been issued across India), the number of customers using Corporation Bank’s service will be limited at first. But it will increase. 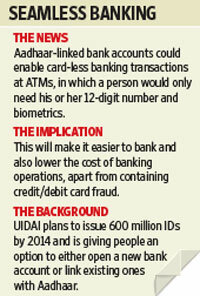 UIDAI hopes to issue 600 million numbers by 2014. The number of credit and debit cards as on January stands at over 230 million in the country, according to the Reserve Bank of India (RBI); the issue cost of each card varies between Rs. 20 and Rs. 80. For cardless transactions to become a reality, customers will have to link their bank accounts with the Aadhaar number. At the time of enrolment, UIDAI is giving people the option of either opening a new bank account, which will be Aadhaar-enabled, or linking to an existing one. UIDAI has already done field tests in Jharkhand and is readying its infrastructure to support bulk transactions. “The servers and systems are currently being tested to see if they can take at least 100 million transactions simultaneously... UIDAI is working to ready them by July this year,” said an official familiar with the development, who did not want to be identified. Both the officials independently confirmed that the approval from the regulator is in place. “The Reserve Bank of India has given an in-principle approval for the plan, but the final go-ahead will be needed closer to the actual launch,” the second official said. “RBI’s main concern is safety... This will take care of all the safety aspects,” added the Corporation Bank official. “It is one of the safest ways to do banking... It will make sure that the right person is using the right account,” said the second official. The move to cardless banking will take quite some time. And the move to cardless shopping some more. That’s because banks will have to install a biometric reader in all their ATM machines and will also have to upgrade the applications on them to make them cardless. There were at least 43,000 ATMs across the country as of March 2010, according to RBI. Moreover, the core banking solution, through which banks integrate all transactions across branches, will also have to support the new model. According to Alpesh Shah, partner and director at Boston Consulting Group, the cardless banking model would have a large impact, but over the next three-five years. “Banks will have to upgrade their infrastructure, which may take a few years. So there will not be much impact in the next six months to one year. But over a longer term, once the concept catches on, it could change the way banking is done,” he said. A Union Bank of India official, who also did not want to be identified, said that while Aadhaar will provide sufficient authentication for transactions, it will take some time for banks to adapt to the new system and put in place the necessary infrastructure. Interestingly, UIDAI is hoping banks will rapidly upgrade their technological infrastructure as a sort of quid pro quo for pushing more business their way. The Aadhaar initiative will be facilitating the opening of several million new bank accounts during the enrolment process. UIDAI is already in the process of empanelling banks for this. Aadhaar has so far enrolled around 4.2 million people in the country and around 80% of them want a new bank account, according to UIDAI estimates. To make cardless banking work, UIDAI will have to link its servers at one end to the banks and on the other to the National Payments Corporation of India (NPCI). Each bank has its own financial switch, which is connected to the national financial switch (NFS). NFS facilitates routing of ATM transactions through connectivity between the banks’ switches. NPCI does the settlement under this network. “If banks agree on such a model, NPCI has no problems in switching the transaction,” said A.P. Hota, managing director and chief executive officer of NPCI. Cashless transactions at retail establishments pose a challenge. “A card is not built only for use in ATMs. It is meant to be used in other devices also, such as point of sale terminals used in retail outlets... So a bank cannot completely do away with issuing the card,” said an official at IDBI Bank Ltd, who did not want to be identified. UIDAI does have a plan to enable micropayments even at retail outlets through what it terms micro-ATMs, essentially low-cost hand-held devices with a fingerprint reader.